Do You Know the Name of the Author Who Wrote The Birds? Probably most of you have seen Hitchcock’s movie The Birds, but did you know that Dame Daphne du Maurier wrote the short story? “The film adaptation of her novel, Rebecca, won Best Picture Oscar in 1941. Jane Eyre by Charlotte Bronte was one of Du Daphne’s strongest influences. Du Maurier wrote The Infernal World of Branwell Bronte, a biography of the troubled elder brother to the Bronte girls. The Llewelyn Davies boys who were the inspiration for J. M. Barrie’s Peter Pan, were Du Mauier’s cousins. (See my May 10th post.) She was friends with Gertrude Lawrence and Gladys Cooper. 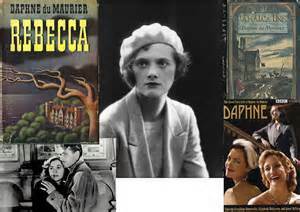 Born on May 13, 1907 in London, England, Du Maurier died on April 19, 1989 at the age of 81. This I did not know – thanks for sharing! I thought Hitchcock wrote it. It was a surprise to me too. I love REBECCA and MY COUSIN RACHEL but did I ever read them or just watch the movies (several times each)? Can’t remember but I shall remedy that immediately. 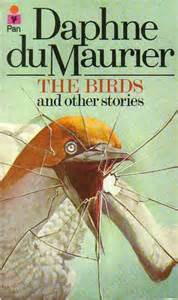 Looks like “The Birds” is one of a collection of DuMaurier’s “macabre” short stories published under that name — goody. Thanks, Jules.